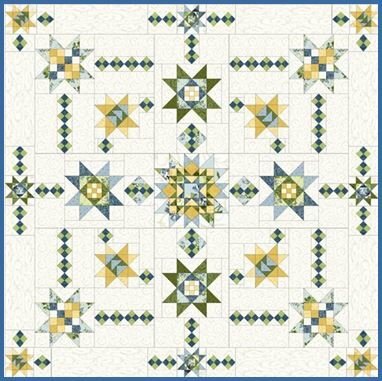 Elegant Stars BOM Quilt - Queen or King! Programs - Most Include Backing! 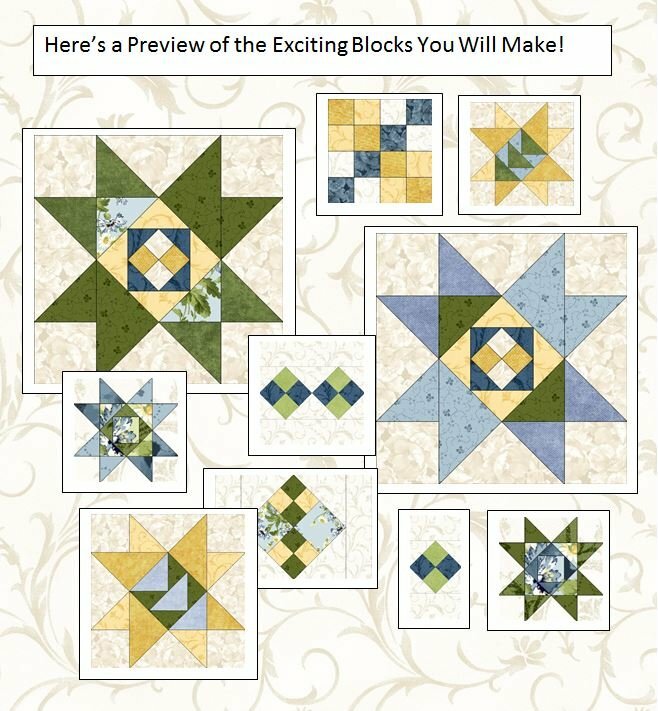 > Elegant Stars BOM Quilt - Queen or King! or email us at fabricessentials@aol.com! Thank you! 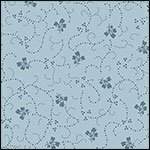 Elegant Stars - A Fabric Essentials Exclusive! 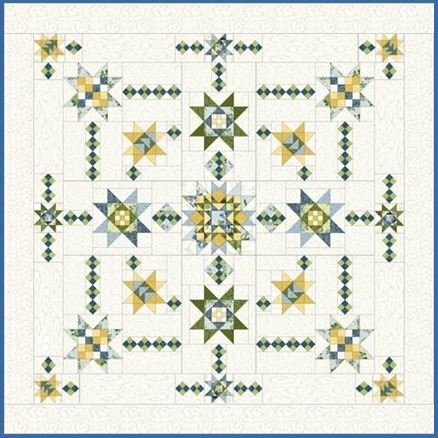 Queen - 101" x 101"
King - Up to 116" x 116"
Elegant Stars - A Fun Quilt to Make! 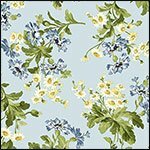 We hope you will join us for this Flexible Block-of-the-Month program featuring the soft blues, greens, creams, and yellows of the Maywood Poppies & Shadow Play collections. This quilt was designed by Marlene Nelson especially for the 2016 Patchwork Party program. 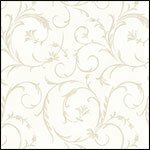 Please note that the actual quilt background color is the cream shown below. The photograph above was taken on a sunny day and looks white instead of cream. Elegant Stars is constructed in a unique manner. You will be making sections of the quilt as you go, and assembling them into large rows. The work is evenly distributed throughout the program so when you receive your final kits, you are nearly done with the quilt! We think you will like this manner of construction! Maywood Studio is known for timeless, beautiful cottons, exceptional quality, great designs and Shadow Play blenders. The fabrics we have chosen for Elegant Stars are shown below. Choose a Complete Kit or Flexible Block-of-the Month Program! This beautiful project includes the Fabric Essentials full-color pattern with exclusive cutting diagrams, a Boo-Boo bundle, and all fabrics for the top, including binding, plus coordinated backing. We recommend that you take 2 or more kits per month as you will save on shipping this way. Some folks take 3 (or whatever fits into a legal flat rate envelope) and then skip 2 months. * Note: Month 16 (your backing) is sent with your Month 15 kit. There is no charge for Month 16 as it was paid for with your reservation fee. * Extra long LOF cut of outer Border fabric so you will have no seams in outer border! QUEEN - This program includes your choice of 45" or 108" backing. There are two Maywood Beautiful 108" backing choices that coordinate with the background of the quilt. 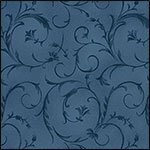 Please Note - The quilt background uses a 45" Elegant Scroll in cream and the binding is Elegant Scroll in blue, very close in color to the 108" wide blue backing shown below. If you choose the 45" backing, we will provide an extra 6" all the way around and we will cut all backing into three equal pieces of 3 1/8 yds each to make it easier for you to work with. Please let us know your 1st, 2nd, and 3rd choices from the fabrics shown below. 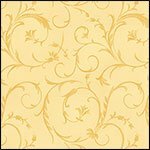 PS If you would like a fabric not shown below, call us at 785-243-4044 and we will see if we can get it for you! This programs uses 45" backing, and allows 5" extra all the way around. We cut your backing into three equal pieces of 3 1/2 yds each to make it easier for you to work with. Please let us know your 1st, 2nd, and 3rd choices from the fabrics below. 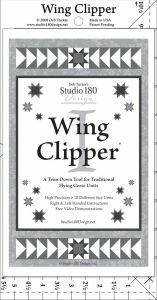 Wing Clipper I Ruler Recommended! We wrote this pattern to take advantage of the Wing-Clipper method of creating perfect flying geese! If you do not have this ruler, you can purchase it here! 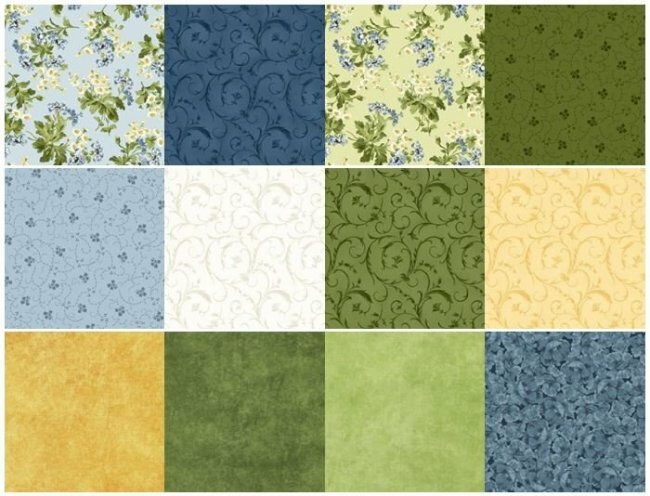 What is the Fabric Essentials Flexible Block-of-the-Month Program? We cut all kits in advance, so you can feel confident that all your fabric is in your kit! When you sign up with us, we put your name on the bag. It's all there from the get-go! No worries that you won't receive it all. And, because it's all cut in advance, you can take as many blocks per month as you want! Many folks take 2-3 per month, depending on your budget and sewing speed. Or, you can start out with one block, and then decide to take more later on. It's totally up to you! Click to read more about our flexibility here.